Just for once, I made up my mind to be optimistic about our (Nigerians) abilities in planning and preparations. I was all for the Census exercise, so much that I took it upon myself as a self-appointed advocate to answer questions and handle objections from people who had issues with it. I was very pleased with the efforts of the Chairman of the National Population Commission (NPC), Chief Samu’ila Makama when a trial census was conducted between 29th August to 2nd September 2005 to serve as a dress rehearsal for the actual census exercise which was billed to commence March 21 and end March 25, 2006. So far, I think my hopes in Nigeria are being successfully dashed again with the turns this census exercise is taking since the past weeks till now. First was the rampage by the recruited enumerators, burning properties to protest the non payment of their wages and now, there are more than enough issues that make me, a self-appointed advocate of Census 2006, to be more confused than Chief Makama. I no longer understand the process of the exercise even though it has been officially flagged off and expected to have started in various states, I can't see any enumerator or NPC vans on the streets and I can't see anybody being counted, not even me, their Advocate. One of the factors I presume might be responsible for all of these is the lack of clarification of 'where to be' during the period of the census. People like me are not sure whether to stay at home or go to work because in our usual confused state, information was sent, maybe leaked out that there will be a sit-at-home order for the period of the census and I heard this was to be declared by President Obasanjo. Oh, maybe it was still in its proposal stage before Uncle Sege and his media assistants did a bad job of leaking it out, what more do we expect anyway, with people like the loquacious Fani Kayode. THE quest for an accurate population figure for Nigeria census began yesterday albeit on a shaky note. And the feeble start was traceable principally, to logistics problems. Economic and social activities were paralysed in Lagos and Ogun States, where restriction was imposed on human and vehicular movements. But the residents idled away for much of the day because the officials of the National Population Commission (NPC), who were to conduct the exercise, were not noticed until much later in the day. Up till yesterday evening, census enumerators and supervisors were still bickering with the state NPC officials over the non-payment of their training allowances. In other states, the census materials arrived late, thereby delaying the deployment of the officers. It was essentially in the evening, that the officials began to work, giving an indication that the exercise would be smoother today. The headcount ends on Saturday. In Oshodi/Isolo Local Council of Lagos, counting started late in some Enumeration Areas (EAs) and did not take place in most others. From as early as 8 a.m. till late in the afternoon, the co-ordinators and supervisors were still collecting the census materials while the enumerators queued for their training allowances. The co-ordinators and supervisors lamented that the first day of the five-day census exercise was used in the distribution of materials to them. They complained that the distribution ought to have been completed three days before the actual headcount. While the co-ordinators waited to collect the materials, thousands of enumerators were in long queues to receive their N5,200 training allowance. The payment, which according to some of the enumerators had been going on day and night for the past four days, started about 10 days after the end of the training. One of the co-ordinators said: "We were supposed to have received the materials three days ago. This is to allow us enough time to distribute the materials to the supervisors, who will then pass them down to the enumerators. The enumerators were also supposed to have concluded the listing of the houses and completed the necessary forms before the actual headcount. Now, they will do the listing with the headcount." Despite the delay in collecting their allowances, the enumerators had a difficult time finding their supervisors. Most were seen carrying aloft boards inscribed with the names of their supervisors. Others kept reading aloud the names and hoping to run into them. Decrying the poor logistics, a supervisor at the council said: "This census cannot go on if the enumerators are not paid their allowances. They are the people to do the actual counting, and they are still fighting to collect their allowances on the first day of the census." It was discovered that some policemen deployed to control the crowd of enumerators opted to benefit from the confusion. They charged the frustrated enumerators between N200 and N500 to enable them jump the queue. Two days earlier, a pregnant woman on the queue was rushed to the hospital with a threatened abortion. And angry enumerators had also gone on rampage breaking window louvres. In some places, verification and clearance exercise were still going on till noon for enumerators and supervisors involved in the census. The development made the exercise to take off very late in areas such as Ogba, Agege, Aboru, Surulere, Mushin and Ikorodu areas of the state, where people stayed at home in obedience to the government order. At Ifako-Ijaiye council area, hundreds of the enumerators were seen milling around as at 1 p.m. yesterday. While some are looking for their supervisors to lead them to their enumeration area, others were seen clutching clearance papers, needed to obtain their identification cards, a requirement for the collection of their training allowance. One of the enumerators who spoke with The Guardian said many had gone back home frustrated, as they could not get clearance despite having their names on the approved list. He alleged that political parties might have hijacked the exercise as many strange faces that never participated in the training were seen collecting registration materials. He added that over 40 per cent of officials were yet to collect their training allowance 24 hours after the NPC chairman, Chief Samila Makama's order to the affected banks to effect payment. But the Lagos State NPC Director, Mr. J. O. Ajayi, told The Guardian that much of the blame for the late take-off of the exercise should be put at the doorstep of the local councils. According to him: "All materials for the house numbering/household listing, as well as the headcount questionnaires had been dispatched to all local government councils over two weeks ago. What might have got to them today was only the bags, which we collected only yesterday, and started distributing immediately. He debunked the speculation that the exercise might have been hijacked by political parties, saying that that was absolutely impossible. Lagos State governor, Bola Ahmed Tinubu, was delighted yesterday, with the residents' compliance with his stay-at-home-order. Commercial activities were paralysed throughout the 8 a.m. to 4 p.m. period, within which Tinubu insisted that all residents should stay indoor to be counted. Expectedly, markets, shops, fuel stations, banks and other business outfits were locked while the roads were free of traffic. A trip from Ikotun, a suburb of Lagos to Oshodi took barely 25 minutes, and security operatives were absent on the streets. While the roads were free of traffic, some stranded passengers were seen at bus stops, apparently praying to be lucky to catch a ride, while a few of them trekked to their destinations. At the Idimu bus stop however, hoodlums blocked the road, trying to extort money from the few vehicles that were still rushing to get to their destinations before 8 a.m. The Guardian learnt that counting exercises did not take place in many places in Lagos. Lack of materials coupled with non-payment of the allowance of enumerators kept the headcount at a low pace in many parts of the Lagos metropolis yesterday. Many residents who were eagerly waiting for the census officials complained that they had not seen the NPC officials. As at 5 p.m., no official of NPC had shown up in Surulere, Kosofe, Somolu, Mainland and other parts of Lagos. Tinubu, his wife, Remi, and members of his household were counted at exactly 10 a.m. officially kicking off the exercise in the state. Apparently determined to ensure the success of the exercise, chairmen of some local governments complemented the efforts of the NPC by paying additional N2,500 for the enumerators. It was after this was done at 5 p.m. that enumerators moved out in droves to different parts of Lagos for the headcount. Despite the shortcoming of the opening of the exercise, Tinubu and his Commissioner for Information and Strategy, Mr. Dele Alake, appealed to residents to stay in their house between 8 a.m. and 4 p.m. in the evening so that they could participate in the exercise. Tinubu said the exercise was important especially for Lagos State, which he claimed had been cheated in terms of the true number of its population. The exercise, if successfully carried out, Tinubu said, would help in planning and distribution of social amenities in the state. He later went round to monitor the exercise. While thanking the residents for obeying the stay-at-home order, Alake said it was meant to ensure that everybody in the state had the opportunity to be counted. Alake restated the decision of the state government to sanction any organisation that went against the order and open its organisation for business. The headcount did not start yesterday at Alagbado, Meiran, Ijaiye and Abule-Egba areas as census officials did not get there. Citizens who had eagerly awaited their coming were disappointed at the end of the day when no census official was seen as at 3 p.m.
Policemen at the Meiran Division Police Station who had been placed on alert by the DPO, Mr. Bashir Ade-Ifanola, loitered around their station awaiting the officials, who did not come as at 3 p.m.
A visit to the Agbado/Oke-Odo Local Development Centre, an arm of Alimosho Local Council, revealed deserted offices and premises. The policemen there claimed that they were waiting for census officials from Ikotun headquarters of the local government. At Ikotun, the payment to the officials was still being sorted out as at 11.30 a.m. with most of them still awaiting their pay. Council officials are finding it hard to cope with the payment, which is apparently very clumsy. Alimosho Local Government is the largest council in Lagos State. Due to non-availability of working materials, the people of Gwarzo council of Kano State were left out of the nationwide head count. When The Guardian monitored the exercise at Gwarzo yesterday, it was observed that the headcount was put on hold due to the absence of basic working materials like forms MPC 07 and MPC 07M necessary for the numbering and listing of households in the council. The development forced scores of NPC supervisors and enumerators to idle away at the council's secretariat complex. The exercise took off yesterday on a shaky note in Ibadan, Oyo State capital and its environs. Inadequate preparations by officials prevented enumerators from conducting the exercise on the first day while some started work late in some local government areas when officials were seen around 2 p.m. going for duty. Yesterday's exercise was marred by logistics problems following the inability of the officials of the NPC to pay the training allowances of the ad-hoc workers. Some of the workers insisted on collecting their allowances before going out for the exercise. Yesterday afternoon when The Guardian visited the Port Harcourt City Council several enumerators were seem there demanding enumeration maps for the areas that they had been assigned to cover. Some of the enumerators attributed their not being on the field as at 1 p.m. to their inability to collect their transport allowance. Hundreds of enumerators had taken to the streets of Port Harcourt and Emohua to protest against the non-payment of their transport allowances last weekend. The problem, which persisted till yesterday was however averted in places like Bonny, Andoni and Opobo due to the intervention of the Rivers State Governor, Peter Odili. He released money for the payment of enumerators last Sunday following the refusal of banks to pay that day. The census took off in Ekiti State yesterday on a shaky note. A visit to Ado-Ekiti, Ikere, Ikole, Gboyin and Ekiti East Local governments by The Guardian revealed that the exercise was just taking off in some parts of the council areas. Some of the census officials complained of shortage of materials. The state governor, Mr Ayodele Fayose and his deputy, Chief Biodun Olujimi, were counted at the Government House at about 11am in the presence of the state Resident Federal Commissioner of NPC, Mohammed Tongo Ahmed. In Nasarawa State, census officials led by Abdullateef Ejijojo registered the state Governor, Alhaji Abdullahi Adamu and his household at noon at the Government House, Lafia. The governor advised enumerators in the state to simplify questions on the census data forms so as to encourage communication between them and local residents. The governor made the appeal after he was subjected to various questions about his household and his home. "You have to find a way of breaking down your questions so that you do not run into problems with the local people. This way, the exercise will go on smoothly. I want to assure you that the state is fully prepared for the exercise", Adamu observed. Though it took over one hour for the governor alone to complete the registration, he said the stipulated five days was enough to complete the exercise nationwide. Ebonyi State was calm on the first day of census after the initial confusion that attended the payment of NPC ad hoc staff at Ohaukwu local government area of the state. Governor Sam Egwu, who declared a two-day public holiday for the census was counted at exactly 10.30 a.m. at his Umuebe country home alongside his wife, Eunice. Speaking to reporters after the exercise, Egwu, noted that the state was upbeat for a credible headcount, saying that this was the first time the state was getting involved in the population census. He said: "The exercise is specifically important to our state as we have always relied on estimated population since the creation. We have put all necessary measures in place so as to ensure that all persons in the state get counted". Meanwhile, most political actors and stakeholders resident in the state capital left for their villages to mobilise their people for the census. Specifically, the Speaker of the State House of Assembly, Christopher Omo Isu, in a statement mandated all members of the Assembly to ensure that every member of their constituency was enumerated. The exercise could not begin yesterday in Kaduna State owing to continued violent demonstrations by enumerators over the non-payment of their N5200 training allowance. In one instance, the NPC Federal Commissioner for Kaduna State, Dr. Ufot Asibong-Ibe was almost mobbed by angry enumerators protesting in front of the Sir Kashim Ibrahim Government House, the official residence of the state governor. Asibong-Ibe's convoy of four cars unknowingly ran into the protesters who had blocked the road leading to the Government House despite the presence of a combined team of fully armed security agents. The protesters carrying leaves and shouting "barayo" (thieves), and "ba' census went wild and pelted stones and other missiles at a convoy of cars conveying the NPC commissioner and other officials. The NPC however escaped unhurt as drivers of the cars skilfully sped away from the scene of the protest. In a relaxed atmosphere, officials of the NPC led by the Federal Commissioner, Ondo State, Dr. Timothy Sule, enumerated Governor Olusegun Agagu, and his wife, Olufunke, at the Government House, Akure, yesterday morning. The governor, spotting a yellow NPC shirt and white fez cap, after performing the civic responsibility, said if the enumerators worked hard based on the number deployed for the exercise, they would accomplish the mission within the time-frame. Agagu, who urged residents to ensure they were counted, said the reliable data expected at the end of the housing and population census, was important for planning purposes. He said it was necessary so that governments at all levels - federal, states and local governments - could be run in a planned way. According to him, honest answers to the types of questions asked by the enumerators, will enable the government to know the status of human beings for now and a projected period of time, as this is necessary for their socio-economic growth. In Abeokuta, apart from late arrival of materials at the co-ordinating centres, the exercise went on without hitches. The NPC Commissioner in Ogun State, Alhaji Ibrahim Khalil Aliu led a team of enumerators to count the State Governor, Gbenga Daniel and his wife, Olufunke, at the Isale-Igbein Government House. Their children were not around. 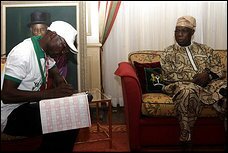 When the governor was asked his occupation, he replied: "I am the Chief Messenger of Ogun State." When Daniel was again asked whether he was schooling, his answer was: "I am in the school of politics." In an interview with reporters later, he appealed to the people of the state to stay at home so as to be counted. "In 1991, the census exercise put the population of our state at 2.3 million. I am hoping that this time around the figure that will be recorded in the state will be acceptable", he said. Daniel added: "I am hoping that there will not be any controversy over any figure that will be arrived at"
The census kicked off yesterday in Cross River State in a poor note. As at noon yesterday most of the enumerators in Calabar South and Calabar Municipal were seen in large numbers in different locations without enumeration materials. In Calabar South, some of the enumerators blocked the streets demanding the payment of their allowances while a set of youths in a blue Kombi bus drove around parts of Calabar saying "no census in Calabar south". The scene was rowdy as the youths in the Kombi bus encountered the police in a shoot-out at Ekpo Abasi junction near the Cross River State University of Technology (CRUTECH). However no casualty was recorded. No major reason was given for the youths calling for no census in Calabar South but sources said this may not be unconnected with the non-payment of enumerators allowances as was the case in Odukpani on Sunday when the Calabar -Itu Highway was blocked and traffic delayed for hours. By yesterday evening, the exercise was yet to begin in Benue State. NPC officials battled desperately to convince enumerators that their allowances would be paid at the completion of the exercise. Benue NPC National Commissioner, Mr. Peter Otaigbe told reporters at Makurdi that the delay was due to payment discrepancies which, he claimed, had been sorted out. He said that top NPC officials from Abuja stormed the state to correct a series of anomalies connected with the authentic enumerators' lists that sparked off protests across the state.